Andy Card knew more information than the President of the United States. Each day he would get up and receive official reports and then he would decide what was the most important information out of it all and tell it to the POTUS ( aka President of the United States), and that is what the Chief of Staff to the president would do. Card, who was George W. Bush’s Chief of Staff from 2000 to 2006, joined students participating from the George Mason University Video Studio along with Steve Scully, the political editor for the C-SPAN networks, and students from the Georgetown University and Purdue University. Card’s job entitled him to have more knowledge than our own President, which is astounding because you would think the President would have to know everything. This heavy flow of daily information, called the President’s Daily Brief (one of the most secret documents in Washington), is what Andy Card said he missed the most about working in the White House. That brings us to a point though, a point that one student asked Mr. Card in the form of a question: What don’t we as normal citizens know? “It’s scary,” said Card about the information that he received, “the enemy really wants to get us.” Card was not only the Chief of Staff to W but was also appointed head of George W. Bush’s White House Iraq Group, and talked greatly about the ‘War on Terror’ and what the country was going through during his time at the White House. Card said that September 14, 2001, just three days after the 9/11 attacks, was his most memorable day at the White House when Bush made his speech and spoke the words “our country was attacked with deliberate and massive cruelty…You are not alone.” Card recalled how they couldn’t allow emotion of 9/11 cloud the decision making process that was going on in the White House at that time. Card’s detailed recounting of 9/11 was extremely fascinating, as the students got a first hand account of someone who was right in the middle of it, someone who got the information first. Now, I will always think of Chief of Staff’s and know that they are probably the most knowledgable person in the country when it comes to what issues are facing our country and national security. Summary: The former White House chief of staff discusses his admiration for the 43rd President of the United States and Obama’s appointment of William Daley as White House chief of staff. “What I miss the most about being chief of staff is the information I have…I found the information to be scary,” Andrew Card said today. Though he has served under three U.S. Presidents, Card is best known for delivering to news of the attack on the World Trade Center building to President Bush while he was reading “My Pet Goat” to a group of second grade students. 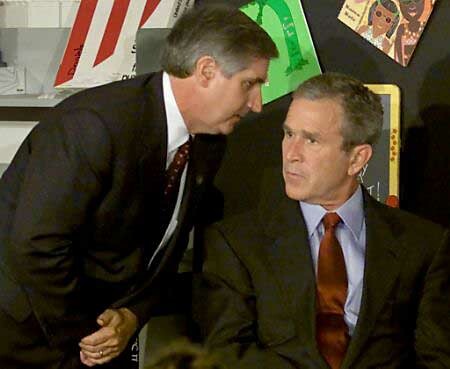 Card said that the Bush administration is misunderstood and that history will judge it better. “He lead with Presidential courage,” Card said of George W. Bush. Card spoke to senior executive producer and political editor Steve Scully during an interview joined by students from George Mason University, Perdue University and the University of Denver. 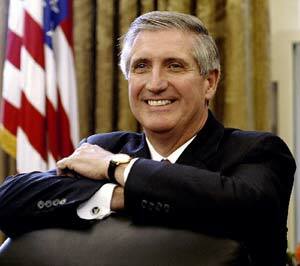 A native of Holbrooke Massachusettes, Andrew Card’s record of public service began in the Massachusettes House of Representatives from 1975-1983. Card served under the Reagan and both Bush’s Administrations. He was the Secretary of Transportation for George H.W. Bush from 1992-1993 and chief of staff to George W. Bush from 200-2006. Card recently joined the business advisory board of Brainstorm Cell Therapeutics, and adult stem cell technology company.